In a speech, Mr. Obama read from parts of the United States Constitution and the Declaration of Independence. President Barack Obama receives the oath of office from Chief Justice John Roberts at the ceremonial swearing-in at the U.S. Capitol during the 57th Presidential Inauguration in Washington, Monday, Jan. 21, 2013. "What makes us exceptional, what makes us American is our allegiance to an idea articulated in a declaration made more than two centuries ago. We hold these truths to be self-evident, that all men are created equal." Officials estimated that over one million people gathered on Washington's "National Mall" for the inaugural ceremonies. Some came for the musical performances. But others wanted to hear how President Obama would define goals for the next four years. In his speech, Mr. Obama said he will make climate change one of his top goals. He said that failing to deal with the threat from rising temperatures would betray the world's children. "Some may still deny the overwhelming judgment of science, but none can avoid the devastating impact of raging fires and crippling drought and more powerful storms. " Environmental groups welcomed the president's desire to act on climate change. The Sierra Club called his comments ‘heartening.' It said global warming is an urgent issue for the whole world. But many opponents of Mr. Obama's policies disagree. They say it would cost too much for the American economy to move away from using oil and other fossil fuels. The president raised other issues of disagreement between the Republican and Democratic Parties. For example, he made it clear that now is the time to re-examine American immigration policies. The president predicted that some immigrants could one day become the country's technological leaders. After the speech, political leaders were quick to comment on the ceremonies. Senator Johnny Isakson, a Republican, thought the event was great. "I thought it was a great program, an uplifting program. I thought the music was fantastic, the poem was fantastic. The president's speech was thoughtful. I thought it was another testament to our constitution and our democracy." Democratic Congressman John Conyers praised the inaugural address. He said he thinks President Obama will make his second term even more powerful than the first. Mr. Obama said that with 10 years of war coming to an end, and the economy recovering, now is the time for America to unite. But, Republican Senator John McCain found the speech lacking. He said it failed to improve cooperation between the two parties. Yet Senator Robert Casey, a Democrat, noted that inaugural addresses are important. "I know there are cynics who say that speeches do not matter and nothing will cut through the cynicism and partisanship. But I disagree. I think all of us at our core share some basic values as Americans. And we need to be reminded of it." 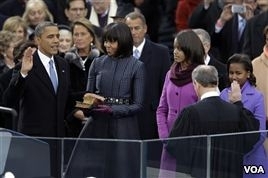 Mr. Obama took the oath of office on two historic Bibles. One book had been used by President Abraham Lincoln in his 1861 inauguration. The other Bible belonged to the civil rights leader Martin Luther King, Junior. People across the United States observed the Martin Luther King federal holiday on Monday. Besides the physiological benefits of exercise and vitamin D, being around trees or absorbing natural daylight will have an uplifting effect on your mood.